The nightlife movement is hosting a festival taking over Kings Cross this weekend. Sydney's controversial pub and club lockout laws have been a double-edged sword in the harbour city, being credited with dramatically lowering the number of alcohol-fuelled assaults but also blamed for crushing night-time culture, forcing the closure of many long-running and beloved institutions, and generally contributing to a more sterile, boring city. 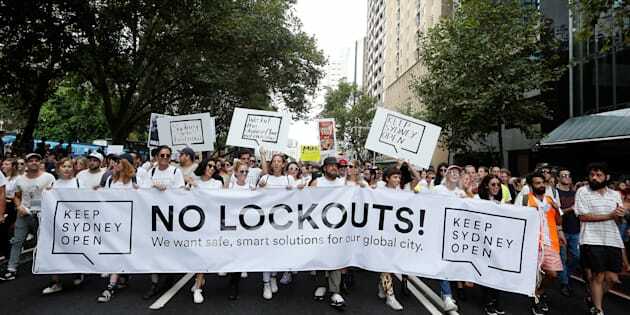 Keep Sydney Open, a movement which sprang up to protest the lockout laws -- initially a 1.30am lockout, 3am last drinks -- has been credited with helping the government to better balance safety with nightlife, lobbying authorities to tinker with the strict laws in an attempt to support venues and culture and holding several huge street rallies to protest the changes. In recent times, the state government relaxed the laws by half an hour, pushing the standard conditions to a 2am lockout and 3.30am last drinks, while certain venues have been granted even more freedom to stay open later after meeting standards set by authorities. Keep Sydney Open's Tyson Koh said the group has had success, but told HuffPost Australia their work is not done yet. "The trading hour extensions are really positive but we've got a long way to go. Its only the odd venue achieving those exemptions, but for there to be a real impact, changes need to be made to entire precincts, because people want to come into an area and be free to move about," he said. "While it is positive, for most venues it doesn't go far enough. It's a fight we took on several years ago and we're continuing to take it up." Koh said the group had enjoyed "productive" relationships and meetings with the City of Sydney, the NSW government and police. Keep Sydney Open were pleased with having achieved other reforms including changes to controversial 'three strikes' rules -- which level big penalties against venues that record three licencing breaches -- as well as changes to small bar regulations. Sydney's pub and club lockout laws have been relaxed recently. "The premier has made it very clear that she won't even look at the lockouts, but we're having a look at other pieces of legislation and have had some really favourable gains," Koh said. "The City of Sydney has committed to a sizeable fund aimed at shoring up Sydney's night time economy, which is really positive, and we're also working with individual venues on applications to extend their licences, where we've a lot of success." Partly in celebration of the recent wins for Sydney's nightlife, and partly to again turn up the pressure on authorities to further wind back the lockouts, Keep Sydney Open will this Saturday curate a music festival taking over Kings Cross. To be hosted across multiple venues in Sydney's infamous entertainment precinct, the event -- named Meet Me In The Cross -- will feature some of Australia's biggest dance and electronic talent including Hermitude, Nina Las Vegas, Thundamentals and more. "We've already had three hugely successful rallies that highlight the issue of failings in Sydney's night economy. We've gained a profile throughout those protests, but we went away and thought about how we could better serve the venues, artists, promoters and people who make Sydney tick after dark. We thought a festival was the great way to achieve that," Koh said. "The Cross, whether you like it or not, is considered ground zero for the whole lockouts debate. As a result, a lot of venues have been doing it tough, whether for negative publicity or the restrictions placed on them for the lockouts. When we tried to have a protest in Kings Cross which was shut down earlier in the year by police, a lot of the businesses were excited about working with us to highlight issues in the area. The festival is an even more productive and positive way of being active in the area and highlighting the importance of the area as an entertainment area." Eight venues and dozens of acts will participate in the festival, running from 8pm Saturday until well into the early hours of Sunday. "It's a ticketed event, $30, and with one wristband you can get into all eight venues. We're encouraging people to check out as many acts and spaces as possible, to go bar-hopping like the old days," Koh said. "A lot of people in Sydney now stick to certain habits and don't discover what's really out there, but we hope maybe people will discover a new favourite haunt on the night."